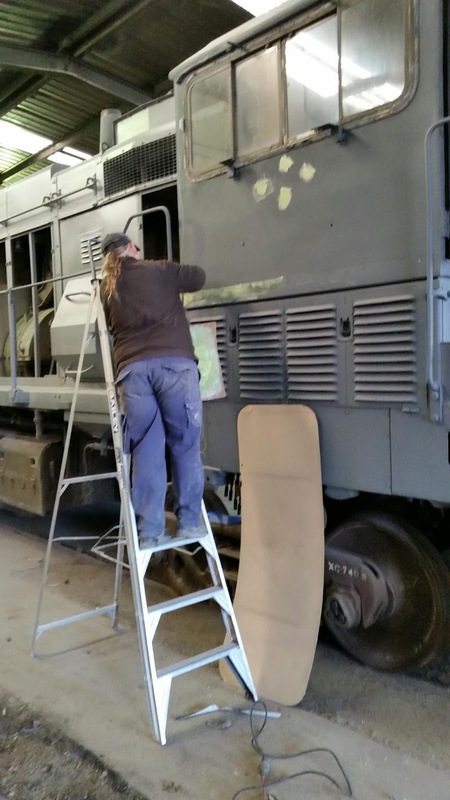 In the last week we have been involved with two trains on top of the usual workshop activities. Details as we progress through. 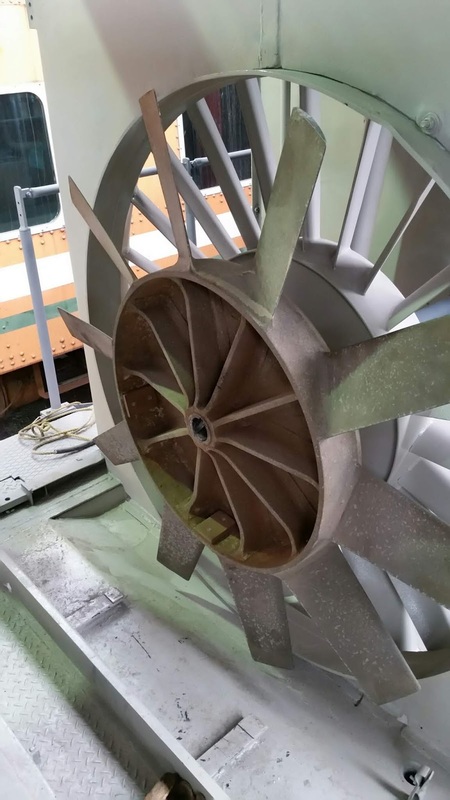 In the long end of P22 the fan has been partially fitted. It is on the shaft but not yet pushed home and had the retaining nut fitted. 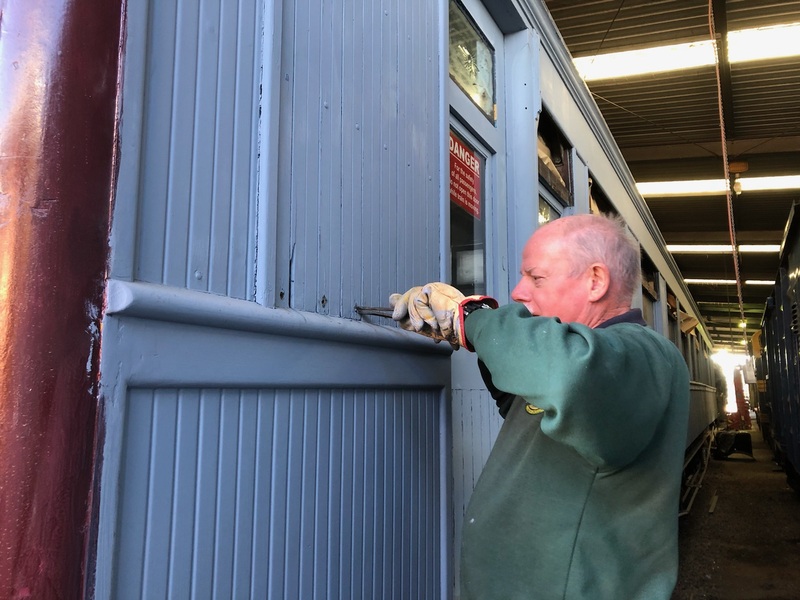 On the outside Robbie continues with preparation for painting. 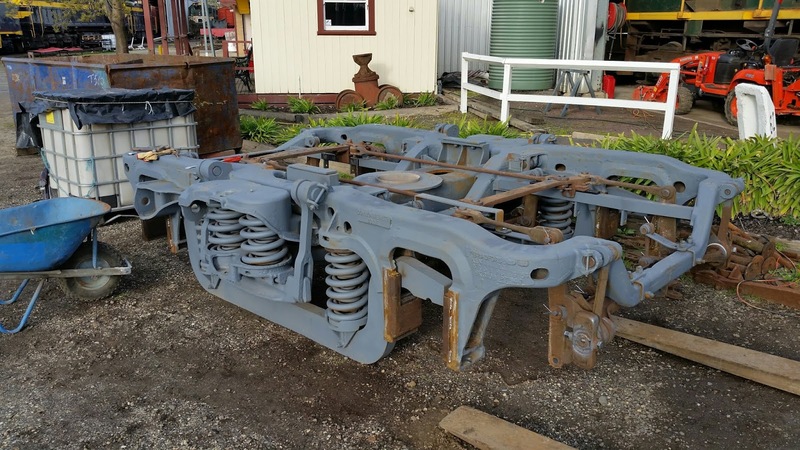 The various body defects are either welded and then bogged or just bogged and then sanded. With the birthday party for B74 looming, the old boy is still being cleaned (as far as reasonably practical). It is already coupled to X31 and T357. 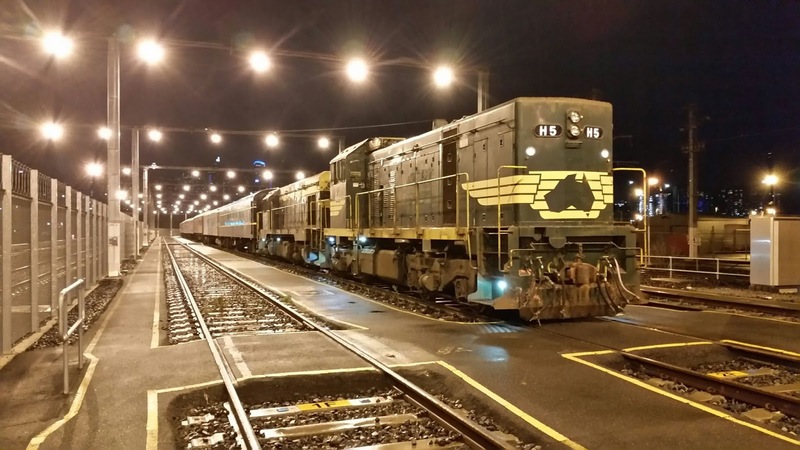 Saturday 21st July was B74s trip to Geelong. With departure at a very civilised hour of 09.00 a couple of line side shots seemed a good thing to try for. 74, 31 and 357 have just been had the throttle put in the 8th notch and the engines are responding. 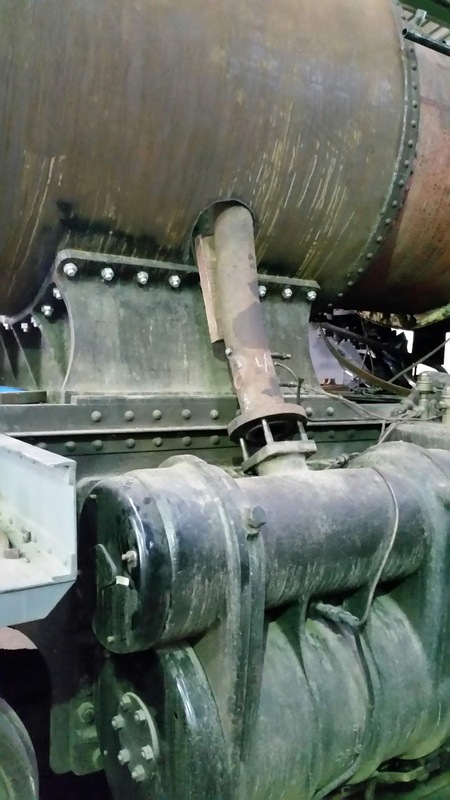 As the locos have only been either idling or under quite low power for the last few weeks, the first time full power is called for results in the build up of carbon to be blown out the stacks. 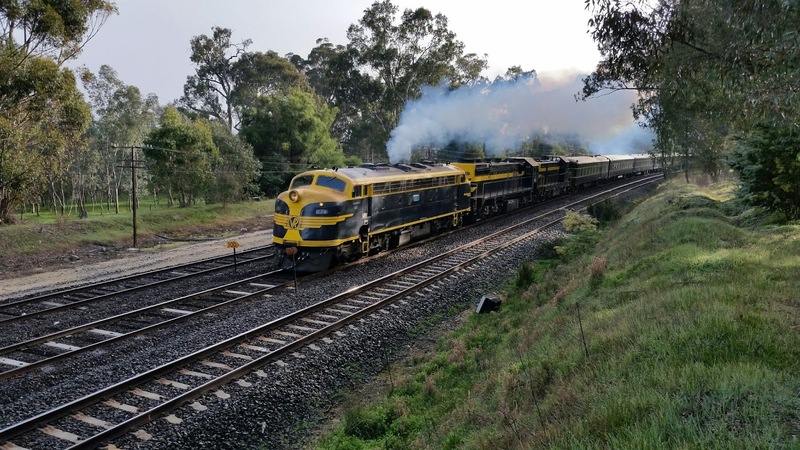 As the train goes past, the diesels are producing better effects than a puffer! 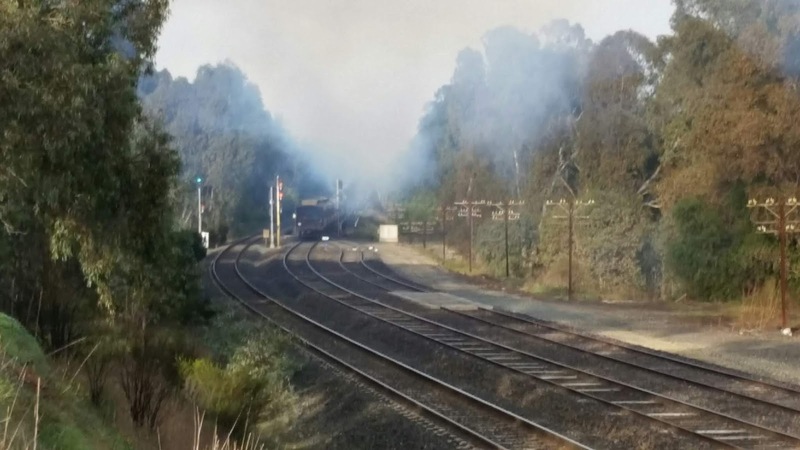 These pictures are taken from the road side at the up end of Seymour near the quarry, barely 1km from the platform. Bringing up the rear is Yarra. No customers on the end platform yet. Exhaust effects still first class! The going away view. It does not show in this shot but the exhausts are now starting to clear although the "fog" may not seem to support that. Max is in one of his thoughtful moods. He has stood aside whilst fitting new timber between the windows of State 4. Most of the tongue and groove boarding is actually covered by metal cladding folded to look like wood. The bits that are not steel clad are around the side doors at the non platform end. With most of this timber not being the best, we have decided to replace it. Hence Max's assignment. On the other side of the car Ross is digging out the bog covering the screw heads on the old timber. More carriages but this time this is 219BS at Newport. Colin is doing one of his favourite tings - wielding a big hammer. It is a bit hard to see but there is a very long cold chisel sticking out under the piece of wood. 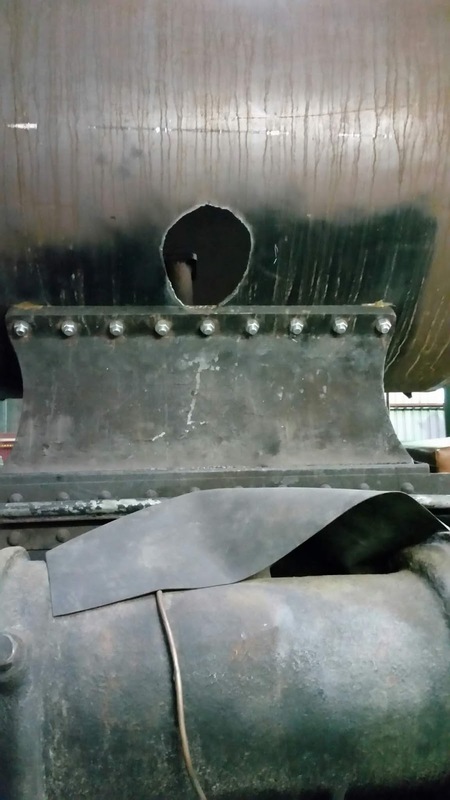 The car has been jacked up about 70mm to enable the side bearer packing to be reduced in height, The welds have been cut with an angle grinder and nor the inaccessible welds are in the process of succumbing to brute force. To run there must be suitable side bearer clearance. 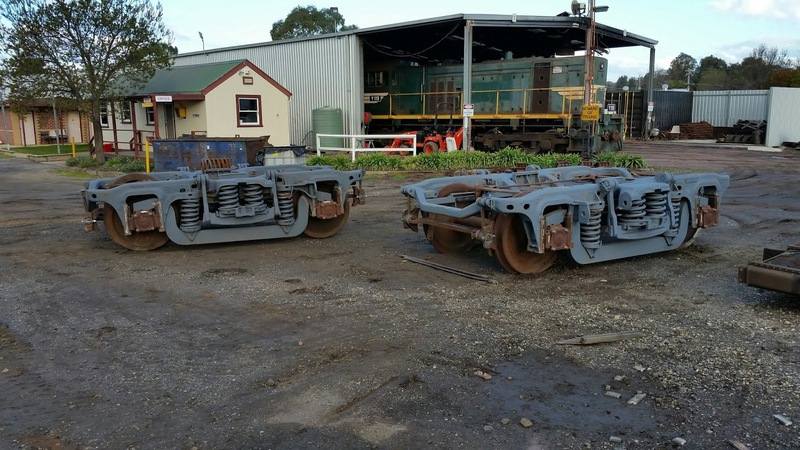 Side bearers limit the body roll on the centres, but if they are in continuous contact, the bogie will not pivot properly and derailment is almost certain. 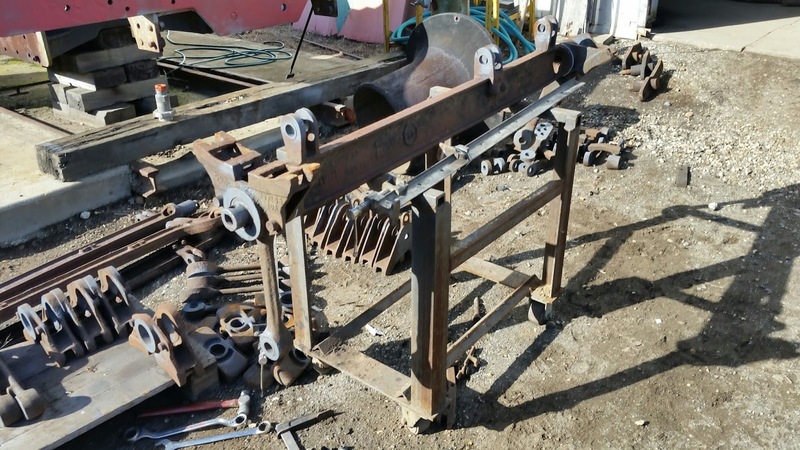 With success with the big hammer, the next and final task is the air brake test. 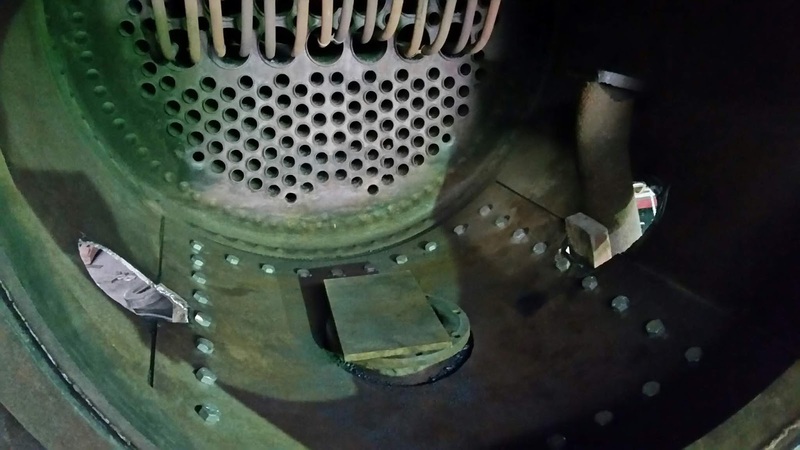 The single car test device is being used to verify the brake operates within the tolerances prescribed. 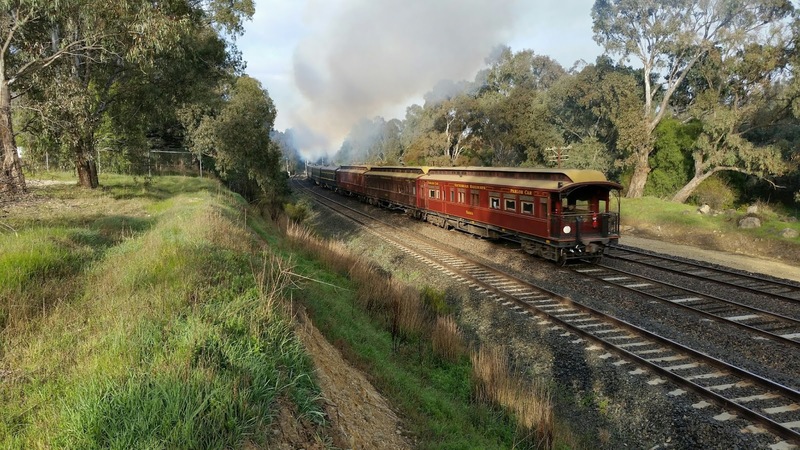 Also at Newport and to be returned home to Seymour, Avoca rests in the afternoon sun. 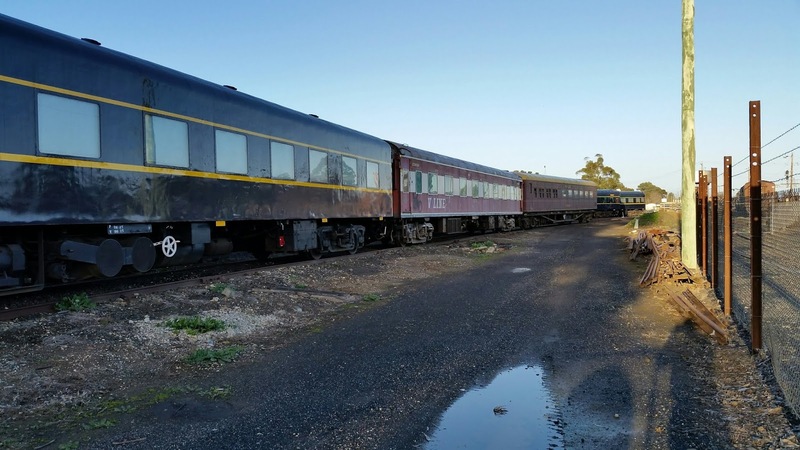 With Dining Car (the formal identity of the Spirit diner) proving a winner in the on train catering business, we need to increase the number of seats available. We are expecting to shop Avoca in the future to address a few issues so that it can play its part in the dining experience. 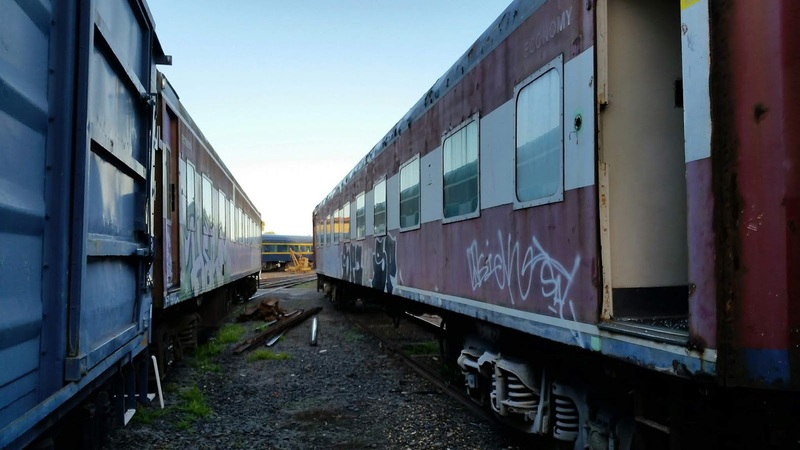 Things like the corridor windows, electrical conversion to AC equipment and external repaint are on the agenda. Bogie works. 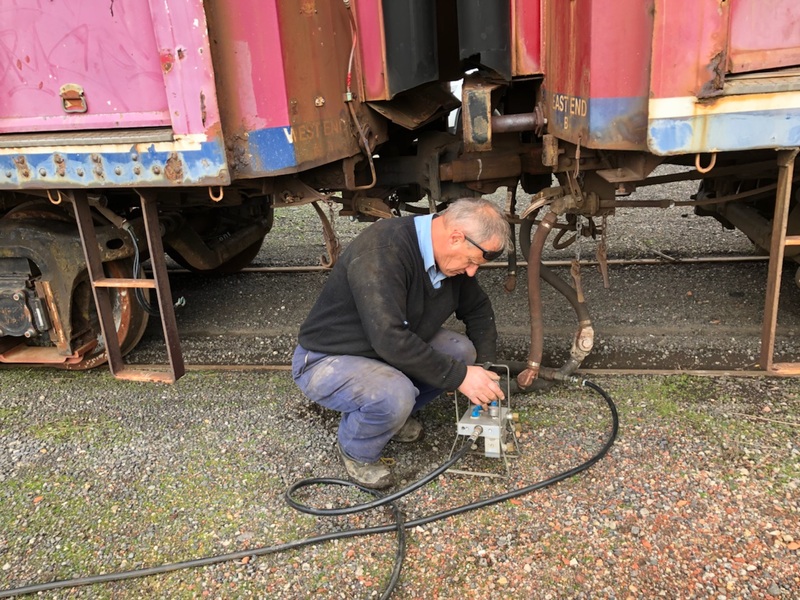 Quentin who is the a third year apprentice with Traction Engineering is welding the liners to the horns of the standard gauge bogies that will be used under 11BS in a few weeks time. It is now Saturday evening 28th July. 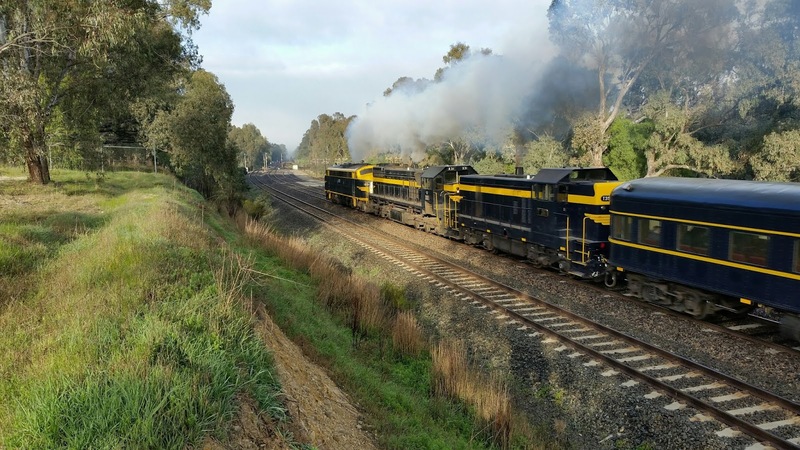 A transfer train jointly organised by 707 Operations and SRHC was run from Newport to Seymour to convey Avoca and 1VAM home after a period of loan to 707. Also on the train is 216 BS and 219BS the first two of the BS cars we bought last year to actually head home. 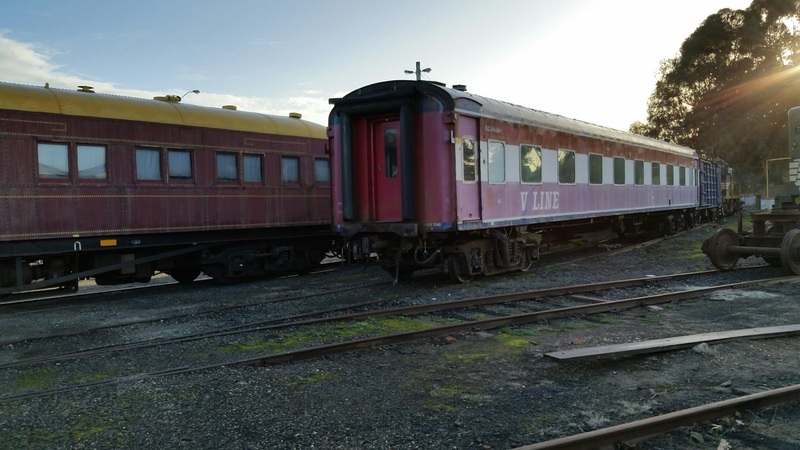 For overnight accommodation for staff a stainless sleeping car with power van along with the club car Victoria. 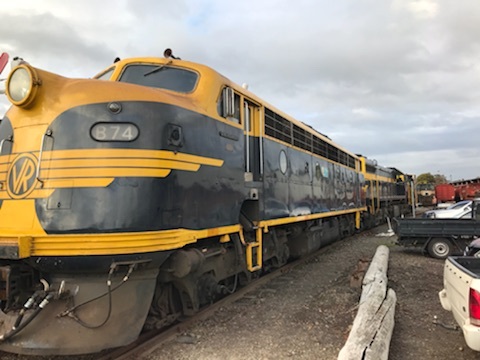 The train has just stopped in the Arrivals Yard at North Melbourne where the locos T413 and H5 will run around to be in position to head north. Having run around and with the rain gone away, the brake tests are under way. 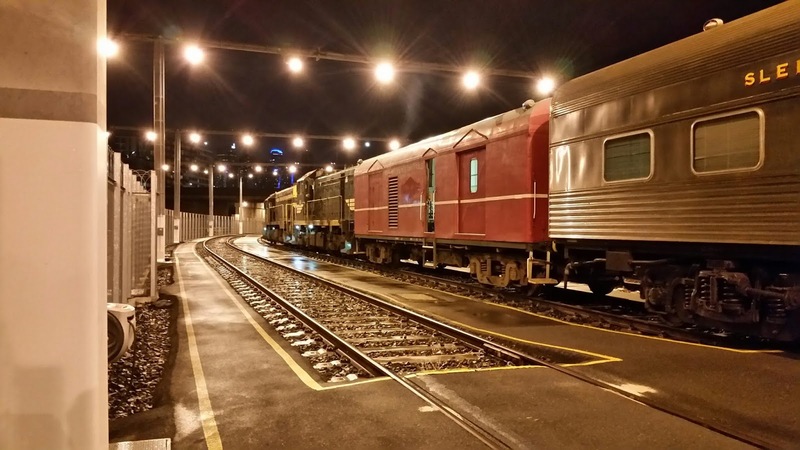 A few hours later very late on Saturday night the train has arrived at Seymour. 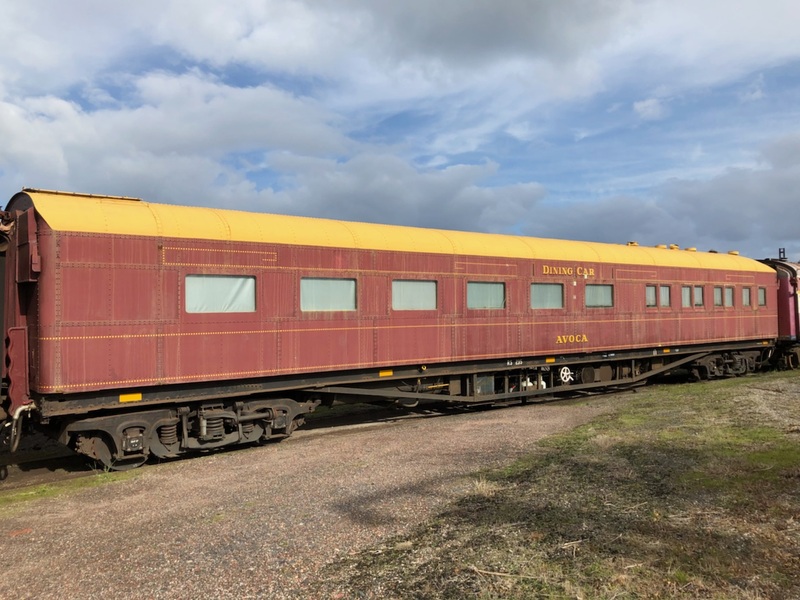 The four carriages for SRHC have been detached and locos F202 and H# have been inserted between H5 and T413. The train will remain hers until 21.00 on Sunday evening before a slow trip back to Newport. In the early hours of Monday the return arrived at Newport after a totally uneventful round trip. 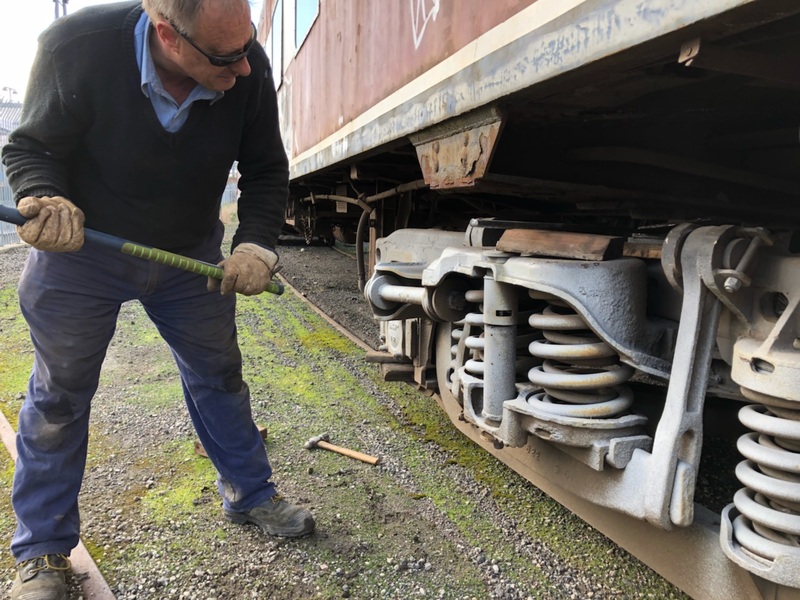 Over the weekend of the transfer from Newport to Seymour and return, Robbie was busy finishing off the preparation of P22. Apart from a final rub down it is ready for colour. What colour will it be? You may well ask. The answer is we know, but you will just have to wait a bit longer. Out in the yard are the carriages from Newport. 1VAM is in the foreground with 219BS following and Avoca in the distance. 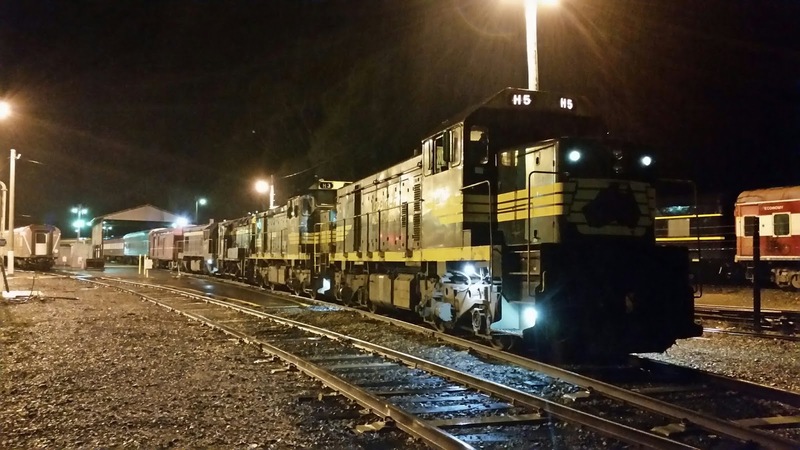 Between tracks 19 and 20 we see 216 BS on the left with 219 BS on the right. For the time being they will stay here before being moved into 4 track for medium term storage. 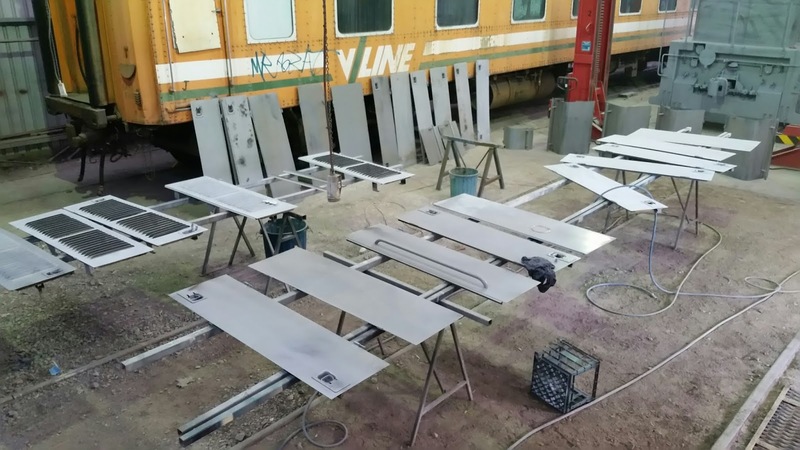 With the splitting of the steel car fleet across broad and standard gauge, there is not enough cars on either gauge for all commitments. 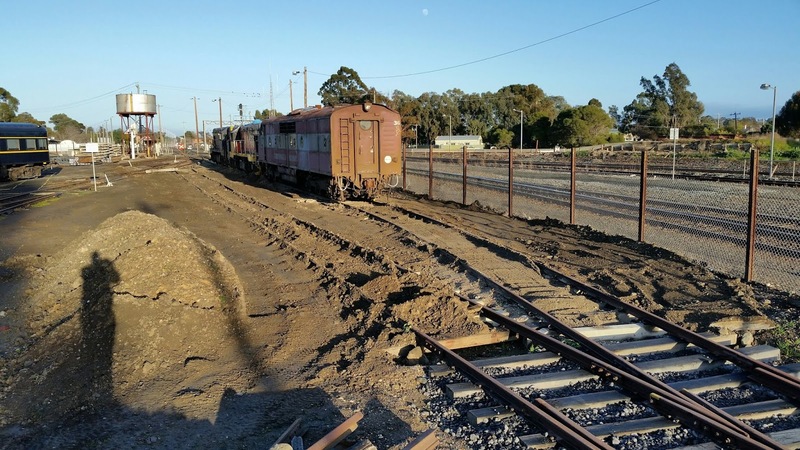 Consideration is being given to the best strategy to address this which will probably mean that a few of the stored cars will need to be restored. We are committed to 1AS but that will not be enough. A final view of 216BS. 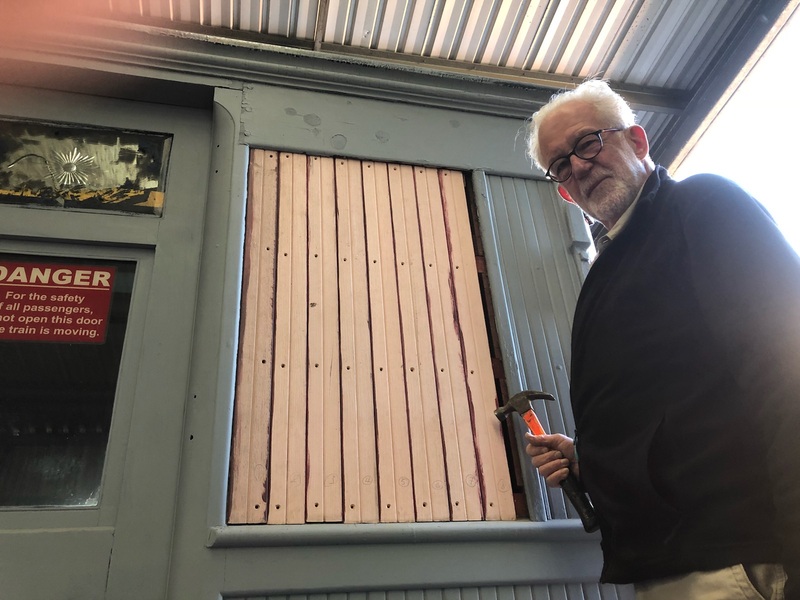 Through the generosity of member Bruce T, a little machine has been made available for a few days. On the morning of the second day much of 21 track has been back filled with tidying up to deal with. So this is the machine. Kevin W is having a ball with this tiny back hoe. It looks like a toy but has proved itself quite capable. We understand that Kevin is going to get one of his own to do the gardening at home! After spending weeks dismantling and refurbishing brake rigging, the inverse has begun. 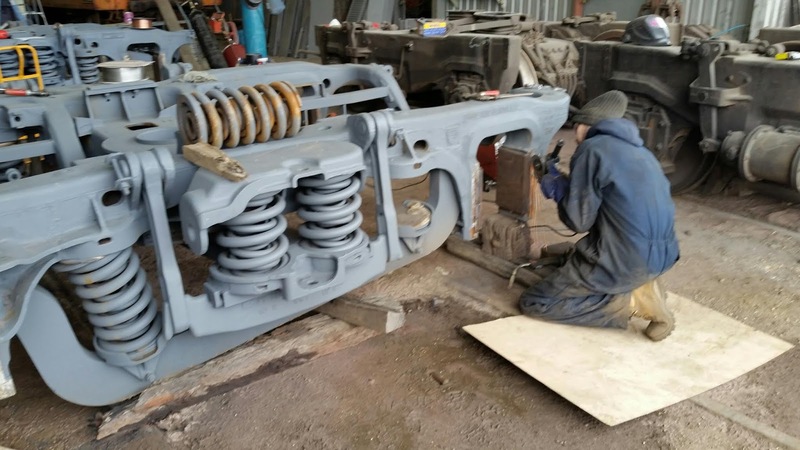 Brake beams are being assembled for the Commonwealth bogies. End of the day shot. 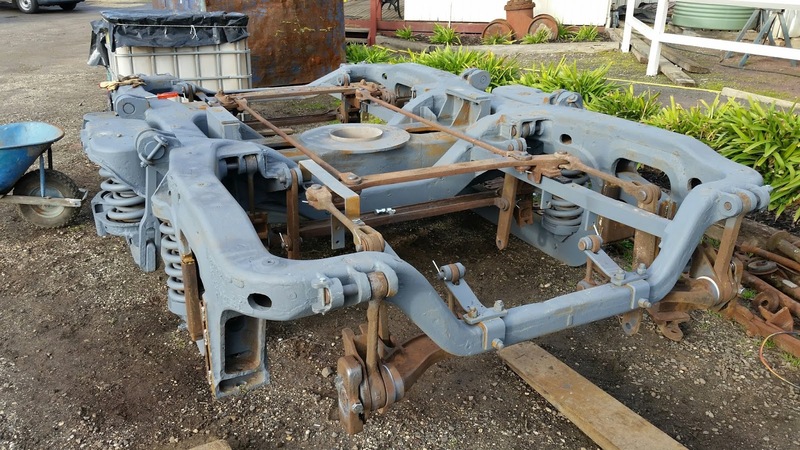 The bogie is now ready for the wheels. More of the same. The rigging in these bogies is amazingly complicated with around 40 separate pins in the linkages. No wonder they went out of favour. But they are renown for the comfortable ride characteristics. Another day another task. With the MIG welder and oxy cutting g gear at the ready further work is under way on J515. 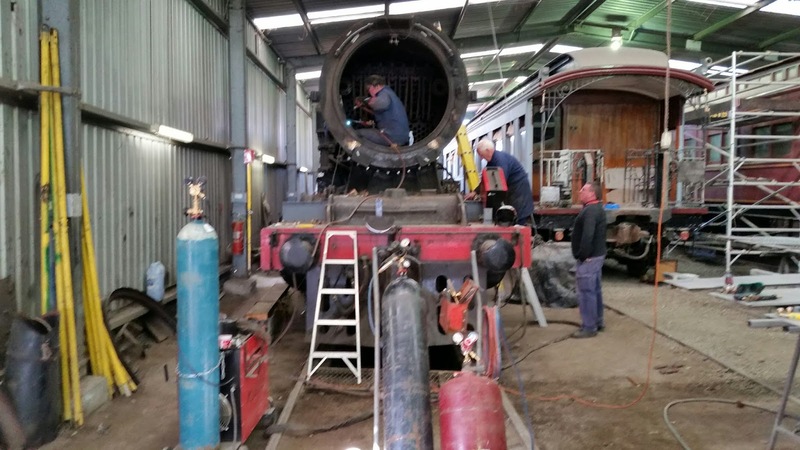 The smokebox is being welded to the boiler and holes are being cut in the smokebox for the live steam pipes to the cylinders. On the Driver's side the steam pipe is sort of in position. The studs need a little adjusting so that the pipe will fit. A job for tomorrow. On the Fireman's side the hole is done, the pipe was trial fitted and will be assembled tomorrow also. Now for the inside view. Hole only on the Fireman's side to the left and the pipe on the other side. At the top of the pipe a right angle elbow connects to the header out of view to the top. 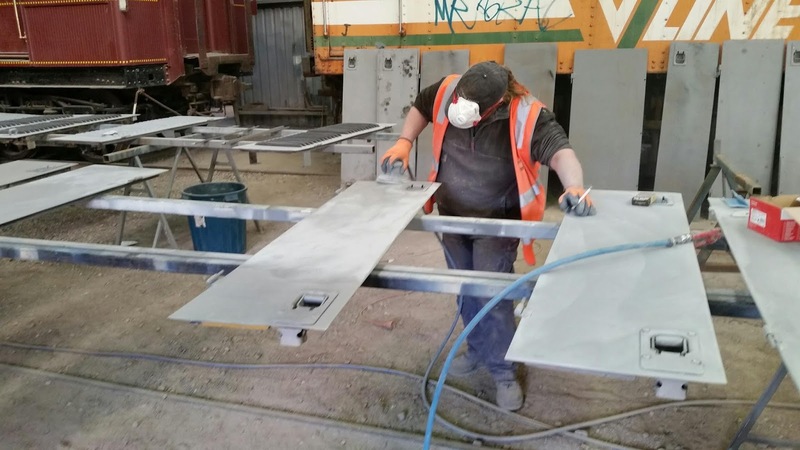 Robbie has set up all the detachable panels from P22 for final preparation. Final sanding is progressing. And to finish for this time. 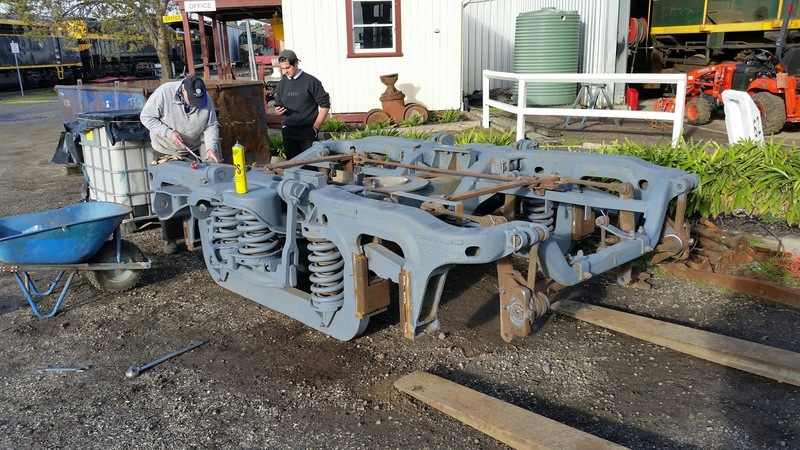 The second Commonwealth bogie had its rigging fitted and both bogies have been wheeled. A few more things to do but nearly there. 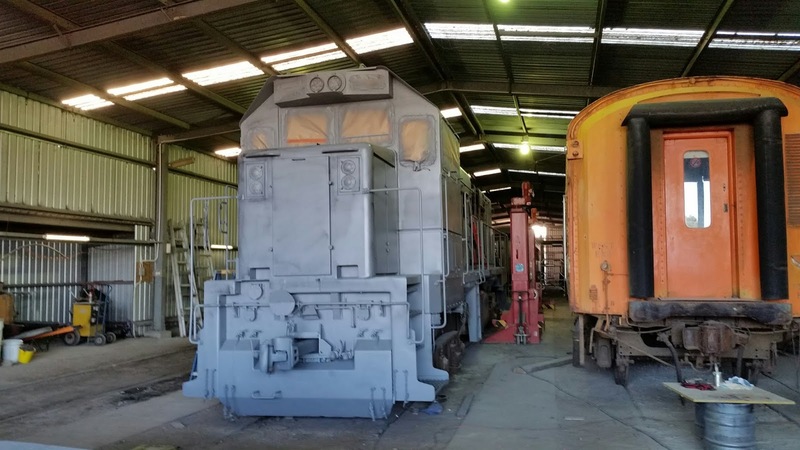 The Harris bogies will be next to be finished. 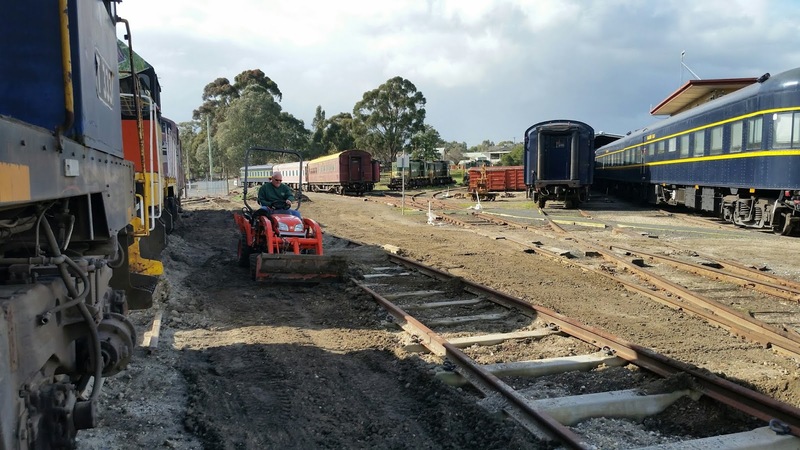 As we get closer to gauge conversion time in the fourth week of August the pace will pick up a bit more.